You have 3934 characters. Don’t forget to add important and relevant keywords in your description to improve your iTunes app page and optimize your SEO. Crisis Action is 3-year-old now! ※ Entered the game for 1,287,915,530 times. ※ Beaten 128,971,141,655 people in more than 30 game modes. ※ Thrown grenades to cause 18,399,720 tons destructive power! Thanks all the long time truly lovers and supporters. 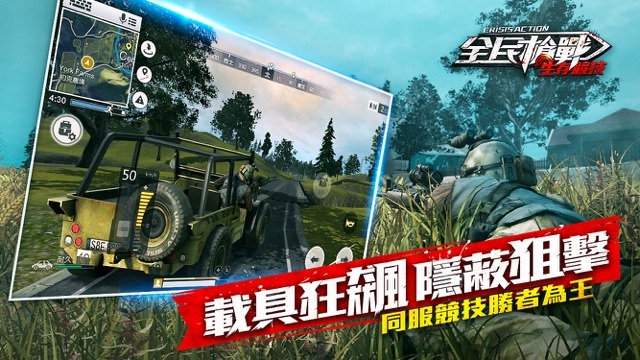 Crisis Action as the first option for Taiwan and Hongkong players, owns various interesting game modes. We have developed the survival modes and Minecraft modes base on the traditional FPS gameplay. Large amount of weapons can be choose, shooting is the only rule! Complete tournament system can satisfy all kinds of eSports needs! The first choice of mobile FPS game – Crisis Action! 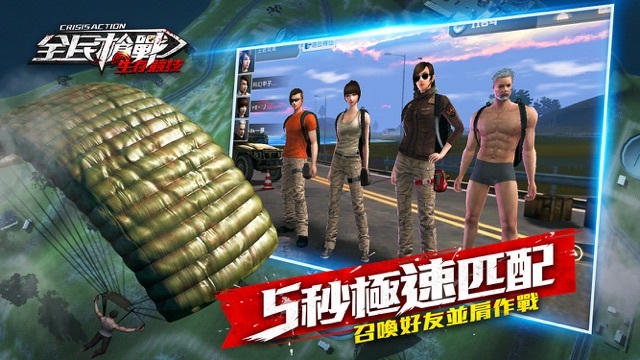 The target of Crisis Action is reproducing the PC FPS game to the mobile devices, no matter the operation methods or shooting feeling. That what we insist on, and help Crisis Action to become one of the classic FPS games. Classic weapons, maps, characters… everything related to traditional FPS you can find in Crisis Action. And we have also developed so many brand new modes to push the game go forward. Never late to join in Crisis Action! 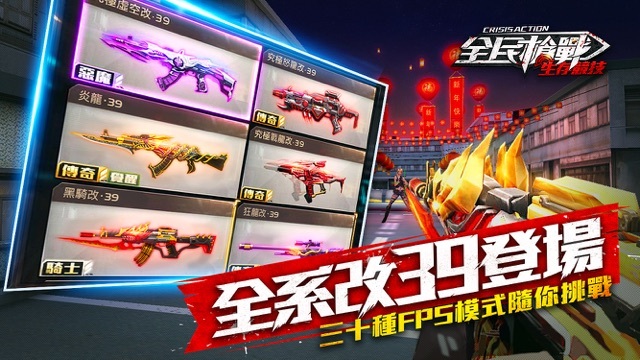 Crisis Action, as one of the most classic mobile FPS game, owns more than 30 game modes, which can meet all kinds of players’ requirement. We can provide Auto rifle, sniping rifle, machine gun… all kinds of weapon you have used in traditional FPS. New weapons also have been released, all traditional strong weapons have been developed to the new generation – Modified 39. New Knight series and Dragon series help you become the strongest solider in the new fatal battle. Try the new guns and be the next hero in the new battleground now! More than 4 million people have joined in our game, which can help you own a 5-second matching and game joining experience. Never fight alone, make a match to know some new friends or summon your real life brothers to play together and find the battle passion back together! In order to return special thanks to all Crisis Action fans, we have prepared various great feedback events. If accumulative landing times reach the certain number during the event period, we will send special rewards to you, which includes permanent weapons, permanent frame and diamonds. New weapons are added into 10 drawing too. More surprises are waiting for you! Clan Nz•T from Taiwan won the 2017 HPL Global Championship, what a great honor! 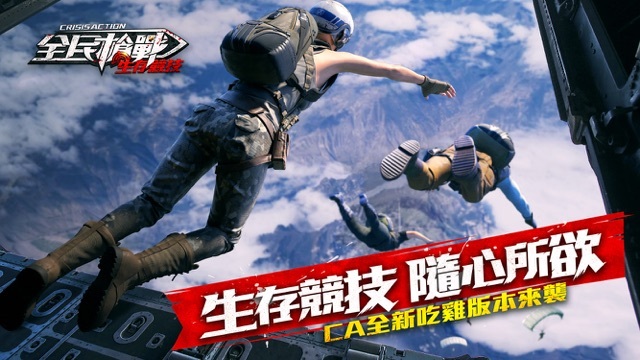 The operation team will also provide the professional tournament and related events to all CA fans, all players can get the chance to win special designed weapons, diamonds even cash rewards. Don’t miss it, you may be the next hero! 迪諾遊戲有限公司 was settled at 2015, which has been concerning on mobile games publishing and mobile esports tournaments developing. Several games published by Dino owned millions player. The HPL global offline tournament is also pioneering in mobile esports tournament field. Note: Crisis Action is free to play, though some in-game items can also be purchased for real money. The software is classified as the 15-years-old grade according to the classification management method of game software of Taiwan.